Welcome to my home away from home for a week in Kauai, Hawaii. 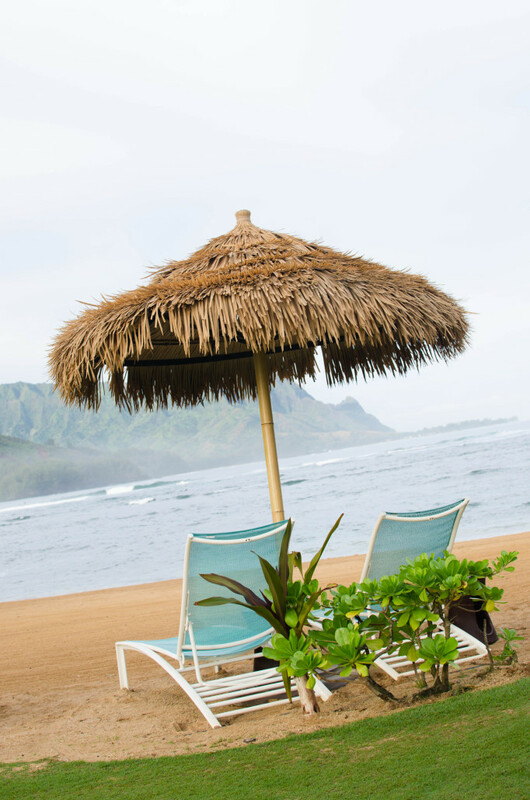 The St. Regis Princeville Resort was as serene and breathtaking as the view it came with. Nothing beats waking up to awe-inspiring sunrises and relaxing to colorful sunsets. Not only did we have a beach to ourselves at the property, but also, the view of the majestic mountains of the Napali Coast. Since we spent most of our stay outside of our room, most of the photos in this post will reflect that. Every night, I looked forward to laying in that big cloud of a bed. Seriously, it was the best sleep ever! And, every morning I would dash out to our terrace (garden/mountain view) in my robe, to watch the sun rise. There is just no bad view from anywhere at this resort. Did I mention the waterfall shower?! Oh yes. If you are wondering what the bed looks like, I posted a photo of our room here and the video I took will include a mini tour of the place (whenever that’s edited). We started our mornings with our Nutty Hawaiian lattes from the Napali Cafe downstairs. It’s so delicious and beats our usual back home (Starbucks). Besides the cafe, there is the St. Regis Bar, where we ate our “dinner” on the first night. We got in from our flight so late, nothing else was open, but that was where I discovered their Ginger Margarita. From then on, that’s all I wanted to order at the resort. For brunch and breakfast, there was the Makana Terrace with an immaculate view of the Napali Coast. We also made sure to try the Kauai Grill by Jean Georges for dinner! More on our food experience at the resort and locally, here. Whenever we weren’t out exploring the garden isle, we would be on the private beach snorkeling, or floating in the infinity pool — followed by a nice relaxing hot tub session. I love the convenience of everything in this resort. The world class service was definitely a perk (at a price, obvs). Most of all, I truly enjoyed the QUIET. Sometimes New York City living is just too loud and you learn to appreciate the downtempo much more. P.S. There are still more photos coming from the trip! Sunrise from our terrace. Breathtaking! Being silly on the terrace. Love the mountain view! A look at the infinity pool and poolside bar. Ginger margaritas, anyone? We loved snorkeling on this private strip! Sunset by the pool. A memory forever imprinted. My favorite sunrise photo. I literally jumped out of the bed to snap this one. Pool, hot tub, beach, snorkeling, beautiful view — what more can I ask for? I can’t get enough of the ocean blues and greens. Oh Napali Coast, you are like nothing I’ve ever seen. Palm trees welcoming us at the front entrance. View from the cliff at Fort Alexander on the property.